These utensils are both eco-friendly, aesthetically pleasing, and durable! Includes: spatula, slotted spatula, corner slotted spatula, slotted spoon, salad spork & spoon. Utensils measure 12"
Why Trubamboo Bamboo Utensils? 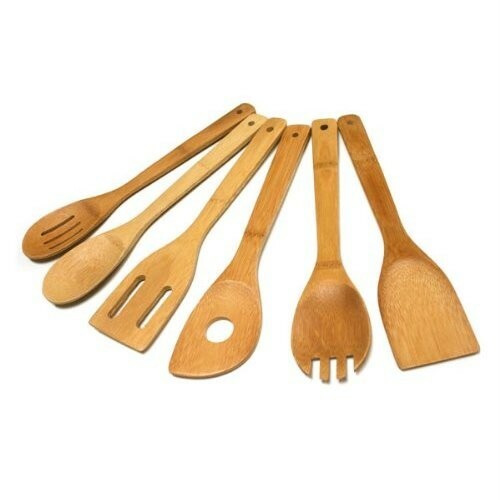 Trubamboo kitchen utensils are all made of 100% organic bamboo. These utensils are both eco-friendly and aesthetically pleasing. This makes Trubamboo kitchen utensils a wonderful alternative to most plastic and wood kitchen utensils. Another great benefit of Trubamboo kitchen utensils is their durability. The production process is 100% natural, using no chemicals or dyes. Trubamboo kitchen utensils are also safe to use on non-stick cookware. Bamboo also has natural antibacterial properties which maintain sterile surface when cleaned and cared for properly. Bamboo is a common material in Asia and has been used for centuries in almost every household. Bamboo has become imbedded in Asian culture because of its strength, flexibility, and durability. In fact, bamboo is used for construction, food, and even medicine within many Asian cultures.